I have been wanting to make dill pickle soup for as long as I can remember, since my mom mentioned to me in passing that she loved a certain dill pickle soup from a diner in central Alberta. This desire was rekindled when I saw a picture from a fellow Albertan food writer about her dill pickle soup this summer. I was intrigued by people’s response to it. Loved it? Favorite soup? Gross? 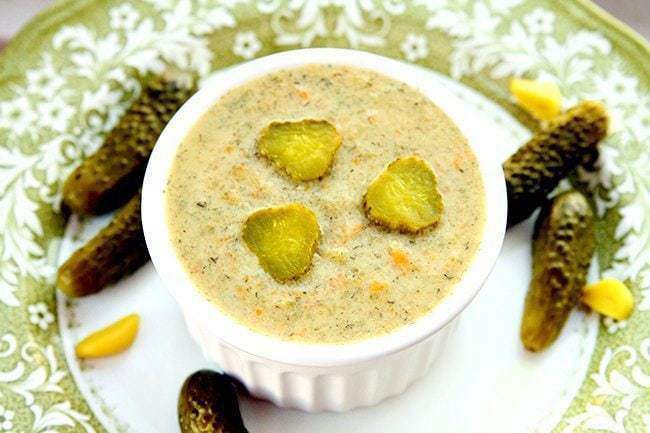 When Mike ate this – with his nose wrinkled up in disgust at the mere thought of dill pickle soup- he exclaimed after a few bites “This is just like eating dill pickle chips! Oh my God, this is amazing!”. He’s absolutely right; this isn’t something you eat to fill up. You are going to need biscuits or bread with it as it’s a very potent soup. Delicious, but potent. I riffed on the Western Producer recipe that was posted this summer and made a few tweaks. I didn’t use flour, I didn’t use celery (it’s my least favorite item in soups) and I’ve upped the pickles and juice for a better flavor. Cream always makes a soup better, you use less and it gives the soup a much richer flavor. The most important thing with this soup is to get the vegetables chopped as small as possible. It’s not supposed to be a chunky soup and even though chunky soups are my absolute favorite, this is definitely not the soup for it. It needs to be creamy with small bits of pickles and vegetables. So about that celery; I honestly don’t think that flavorwise it needs to be there. Texture-wise I’m completely grossed out even thinking about it but if you are a celery lover and you feel that this soup needs it, then go for it. If I really thought it needed the flavor I would have used some celery seed but in all honesty this was perfect for us. I won’t tweak this recipe, change any amounts ever and that is a rare thing for me to say. You can make a few changes, like adding cornstarch to thicken at the end (try not to use flour, am I the only one who can taste it in soups sometimes?) and adding more cream if the soup is a little too strong for you. Taste test and add what you need. I highly suggest pureeing the soup at the end instead of using thickeners and you have a lovely gluten free soup (make sure that your pickles and vegetable broth are gluten free). If you chop your vegetables small enough those potatoes are going to fall apart and thicken the soup for you and that’s the best way flavor-wise. Who’s on board with trying this soup? Yay or nay? Will you trust me enough to give it a whirl? Dill pickle soup? You betcha! 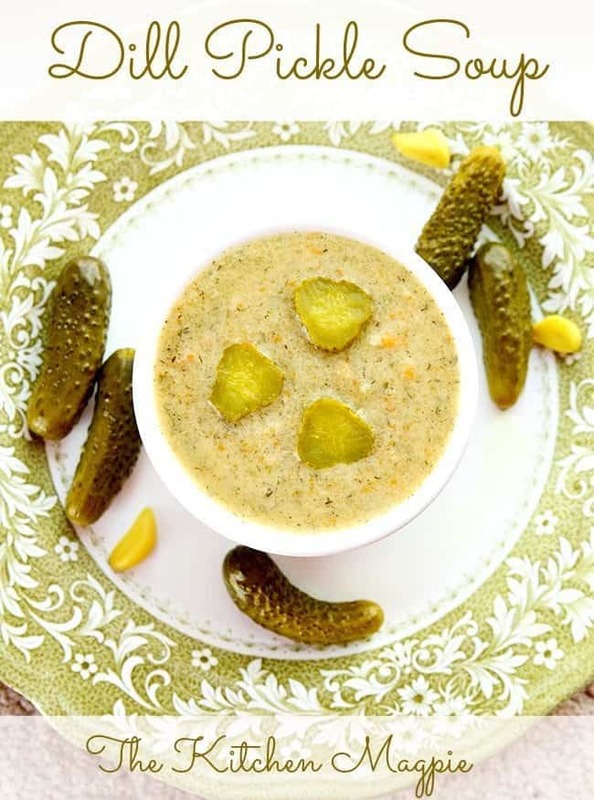 If you love pickles or dill pickle chips you are going to love this soup! Pour the vegetable broth into a crockpot and set on low. Take the potatoes, carrots and onion and using a food processor, grind until the vegetables are in small chunks. Alternatively, chop up your vegetables as small as you can. This soup should be a smooth soup, not chunky. Place into the crockpot and add the dill. Cook on low for 6-8 hours until the vegetables are tender and falling apart. Around half an hour before serving, add in the pickle and the pickle juice. MAKE SURE that your vegetables are cooked or the acid can stop the cooking process (just like it does in pickling!) and you will have hard vegetables. Add in the pickle juice slowly and TO TASTE. You can have different strengths of pickle juice! Add it in until you are happy with the taste. Take a hand blender if you have one and blend about 1/3 of the soup before serving. This thickens the soup without flour and I think this adds to the taste; there's no flour taste in the soup, just pure pickled goodness. I try to avoid flour whenever I can in soups. Stir in the half and half cream a few minutes before serving. The soup tastes ok. 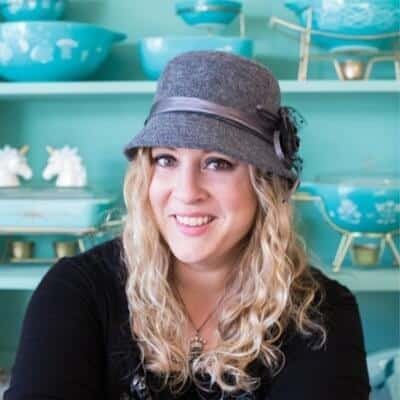 I love the culinary arts and love to make my own adaptations to recipes. I followed this recipe to a tee. The soup was not creamy even with blending the vegtables. As soon as the cream and pickle juice mixed it seperated and made an unpleasant consistancy. I am not a fan of this recipe compared to others big time. I’ve made this and it is GOOD! She’s missed two Monday’s in a row. It’s been glorious. It’s so good!!! And yes , pretty sure that’s where my mom tried it! Goodness. Our stolen recipe has been stolen. Continental Treat here in Edmonton has made it for years upon years as well, and a big US food blogger made it go mainstream as well. It just keeps getting stolen lol! I am thinking of trying it with some lite sour cream instead of half and half.. what do you think???? It would add more tang but would be creamy and rich! ok, today is the day! had this saved forever but now have 2 leftover baked russets, and everything else to make this! I have made this recipe and loved it!!!! Interesting. I think Id try it at least once! I made Dill Pickle Soup once, admittedly it was not the recipe you posted. The lone reviewer, other than myself, stated “It tastes too pickley”. I loved it though. Soooo good. It’s a surprise, isn’t it! Who’da thunk pickle soup was so good! A specialty at Sisters Bistro in Montmartre Sk. I love Dill Pickle Soup. My son introduced me to this soup when he went away to university and frequented that classic diner in central Alberta. I came up with a chunky version that my family enjoys but I might give your version a try. 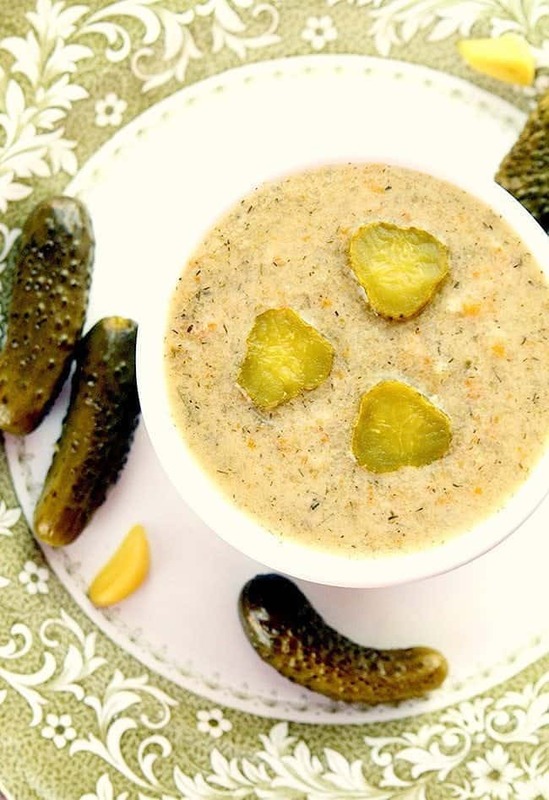 Dill Pickle soup is a family favourite, especially in the winter. Have made it – love it! It’s not the ads, it’s the theme and we have a new design coming this week! 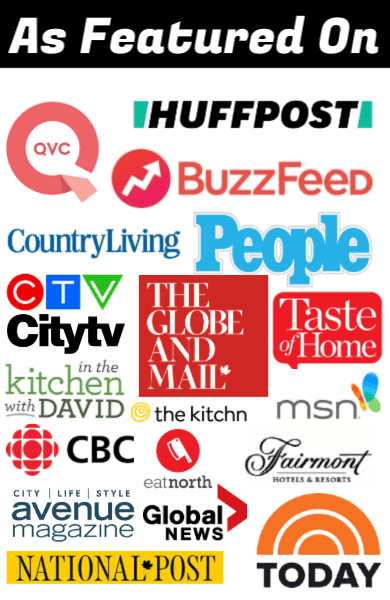 I’m with the same ad company that most bloggers have. It very good. Made it a while back. LOVE this recipe and make it often all winter! I am ready for winter soups! Dill pickle soup is soooo good! This is the best soup ever. Ever. I can’t wait to be home and make it!! Craving it! I’m so happy to see this!! I love dill pickle soup! Tamara Lee, you might like this!